Discussion in 'Adventure Gaming' started by Zombra, Nov 8, 2018. This looks like a cool idea. Procedural crimes, "thought cabinet" deduction board, you solve 'em. My interest was particularly piqued when I saw that the developer is Blazing Griffin, who originally published The Ship, a cool murder mystery type game that ultimately fell short for me due to its reliance on multiplayer. Then they became proper developers, remastered The Ship, and additionally developed a spiritual sequel, Murderous Pursuits, which (judging from reviews) improved the formula in some ways and declined in others. Intriguing as another "find your target, anticipate your hunter" type of thing, but again the multiplayer focus makes me less interested. But I find this whole type of game, where several possibilities exist and you must be perceptive and thoughtful to prevail, very stimulating. This time around it's about single-player investigation and deduction. Hopefully without the millstone of multiplayer around their neck they can make a good detective game. I'd like to see what they've learned about what makes information gathering and deduction fun. Will be keeping an eye on this. I always have wondered if procedural detective cases can be done. But then it has been done before twice, apparently. I loved the idea of Murder on the Zinderneuf as a kid ... even by 1983 standards though the interface was awful and trying to play it was a chore. (It's also possible that I was too young and stupid to appreciate it, but anyway that's how I remember it.) Making this idea actually playable is an exciting prospect for me. I finished Murder on the Zinderneuf atleast dozen times and, for me as a kid in general, there was no such thing as a bad interface, only a interface you need a bit more time to get used to. In Zinderneuf randomness was the biggest plus but also the biggest flaw of that game since scenarios could go all over the place. Like this one time a victim was murdered with a army knife and there is only one soldier among the crew (I think his name was Jack London) so you solve the crime in 5 seconds or in another game get a single vague clue that doesnt help you one bit. Still I had so much fun playing that game, picking between multiple detectives and trying different approaches in solving the mysteries. They make a bold claim in the following tweet, can you spot it? Neat blog post detailing the inspirations for the game. Instead of a broad-based game with lots of different activities they decided to do fewer things and do them right. I like the direction they're taking this. In this blog, Pete lead designer on the Murder Mystery Machine investigates the Murder Mystery genre and the inspiration behind the game. When given the opportunity to explore an original game idea within the murder mystery genre I was hesitant at first. Admittedly the genre isn’t one that, as a gamer, I’ve spent much time with. As a designer however, this can be an advantage – less bias and pre-conceived notions. Keen to become knowledgeable quickly, I immersed myself in murder mystery. I like to start my research outside of games and get a sense for what’s popular right now, in a genre. I also like physical connections to the things I’m researching, as simple search engine results fail to really connect you to what people positively associate with their passions. 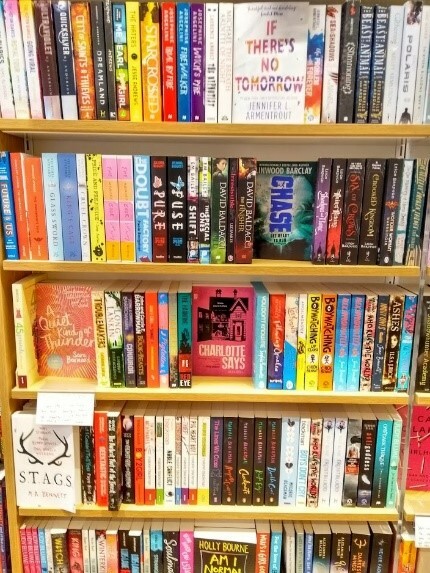 A great place to start is your local big-chain bookstore, so off I trudged and found myself staring at the teen/young adult section. I was immediately struck by the sheer number of murder mystery novels it had. I studied the cover art and read back covers for a couple hours. I took a few photos to show my colleagues. Hitting up streaming services next and there’s no shortage of highly rated crime and detective dramas to binge watch. Over the space of a couple of weeks I watched True Detective (don’t hate but I thought Season 2 was better), some Narcos, The Sinner, Dark and Mindhunter which quickly became one of my favourite shows. My early deduction was that the genre is healthy and popular with the demographic we normally associate with gaming. So why, when we analysed the video game market, did it paint a different picture? When approaching a new game concept, I like to first determine the problems to solve. In this case it seemed clear that as a platform, video games are not pulling their weight for a popular genre. Why? Something we noted early on was that a game involving detective mechanics could get bogged down in having to do a lot of things right. The skills that detectives employ in their work can range anywhere from psychology to forensics and much in-between. In some ways this could explain the split we noticed with successful games in the market either being big budget with a broad range of mechanics and storytelling techniques vs small indie titles focused on doing a few things well. That’s our first decision made. We don’t have a AAA budget, so we’ll go small and focus on doing a few things well. Next problem – Is there anything people want that they aren’t getting? 1. Watching What Makes A Good Detective Game? by Mark Brown. In it, he focuses on the things that might make you ‘feel like a detective’ and what games have tried in their attempts to do so. Ultimately, he poses the idea that it’s this problem that many detective games have failed to solve well - so we’ve made this one of our goals to achieve. 2. While paper prototyping some ideas, we immediately became interested in how people like to gather and sort information. Suffice to say, everyone is different, so we’ll allow for that. 3. I watched an episode of Mindhunter on Netflix where the main characters find themselves, yet again, talking to small-town police with an unsolved murder. What struck me watching THIS time however was how, with only a few pieces of evidence and background from the police officer, Holden Ford a young criminal psychologist, imagines a plausible and detailed theory that the police never thought of. “Someone would do something like that?” The police officer is shocked by the idea. Holden has a completely different background from the officer so can offer a different story. The theory isn’t right, Holden’s first theories rarely are but it does open new lines of questioning and ideas for the police who do eventually discover key evidence they’ve been looking for and solve their case. 4. 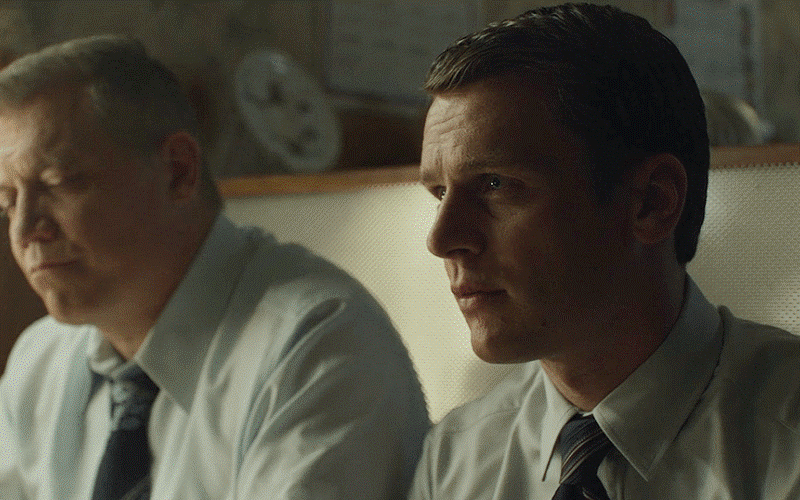 A timely quote we discovered by famous murder mystery author Agatha Christie: “Unless you are good at guessing, it is not much use being a detective.” So we look at informative guesswork, just like Holden Ford is doing in Mindhunter, as a key element in ‘being a detective’. 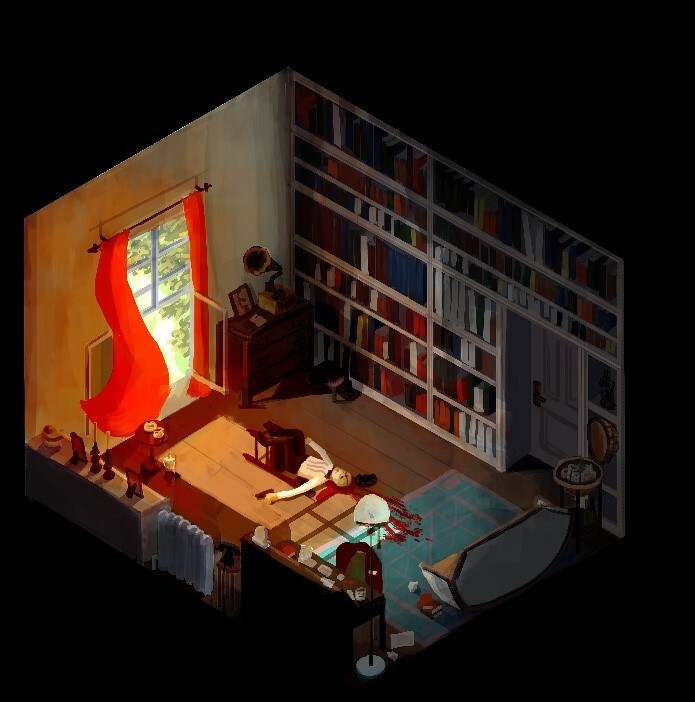 An isometric view best represented how a detective perceives a crime scene. We could play with lighting and camera rotation to make use of the entire space to enhance the exploration aspects of the game and help support an atmosphere that immerses you into the scene. 6. An academic article I was reading about the mechanics of murder mystery writing and the idea that a murder mystery is, in fact, two stories. The ‘first story’ is the actual events as they happened. The ‘second story’ is the way in which the detective discovers and interprets the first story. The details in-between the facts, the ‘drama’ could be anything. Put Sherlock Holmes, Mrs. Marple, Mulder, Scully and Rust Cohle on the same case. They may all reach the same conclusion, but the way they tell the story can be vastly different. Their personal experience, the order they discover evidence and the way they interpret it will all be different. This also seemed relevant to the issue Mark Brown raised with regards to what might make you ‘feel like a detective’. Instead of role-playing an established character who must do things the way they are designed in order to make you feel like them, let’s just let people be themselves. 7. 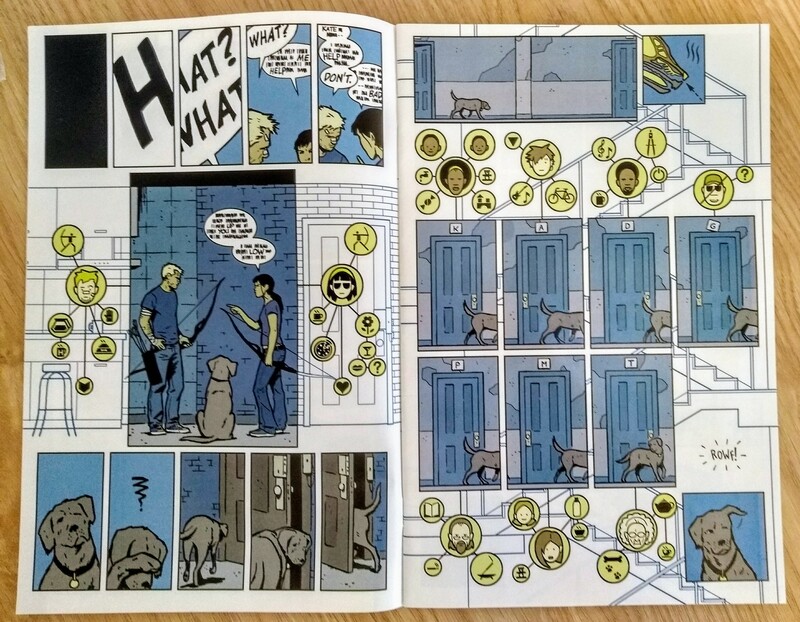 One of our UI artists mentioned a Marvel comic, Hawkeye 011 featuring Lucky a.k.a Pizza Dog by Matt Fraction and Aja Hollingsworth. The entire story is presented from the point of view of the dog in the form of connecting icons and just a few words (the one’s the dog knows). This abstracted form of storytelling through connecting icons mimics a detective’s classic style pin & string evidence board. This would form the backbone of the entire game and how you will tell us your story. We then took this image around the office and asked people “what do you think happened here?”. Amazingly every story was different. Everyone had a plausible explanation and thought of things that the image itself was never designed to elicit. This level of engagement hit on every point above. For a moment everyone in the office became a Holden Ford or invoked their ‘best guesses’ and told second stories. In my mind anyway, they became detectives. This effect was heightened if you asked two or more people at the same time to interpret the crime scene. They would feed off ideas and argue others. It felt right. We present a crime scene, you tell us the story. The next problem we decided to give ourselves was that of creating a procedural engine to support the delivery of these scenes. More about this in an upcoming blog post. Written by Pete Low - on behalf of MMM team. Lead Designer at Blazing Griffin Games. The first blog post detailing gameplay concepts. I really like the "workspace" concept. Hit the link if you want to see the video where the guy shows an example case being solved, it's worth seeing. In the first of a series of posts, we delve deeper into the core crime scene gameplay of MMM. At the centre of each murder lies a victim and we pay special attention to them as part of a non-interactive sequence. MMM features several introductory sequences where we focus on the body and related evidence to prompt you to make guesses about what happened to them. In one introductory sequence, we zoom the camera slowly out from the body to reveal more and more surrounding details. In another sequence, we present the player with a fast series of snapshots - each focused on a particular item or person - to create a sense of urgency. Crime Scene Investigation forms one half of the interactive gameplay. 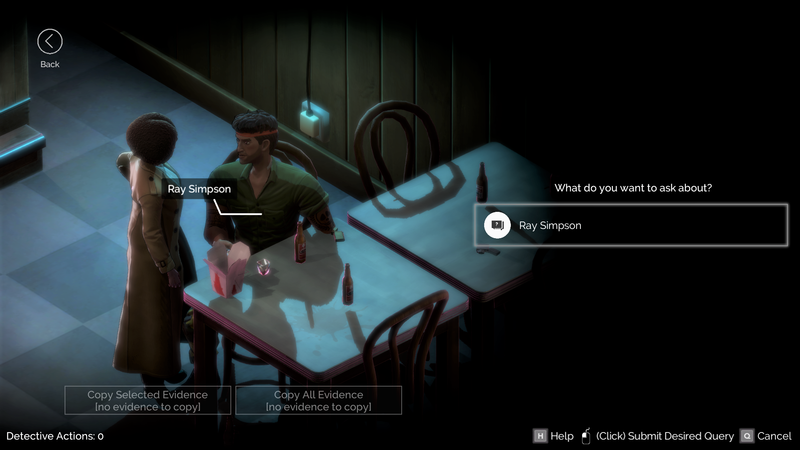 We give players the opportunity to move their detective around the environment using a point-and-click style interface. 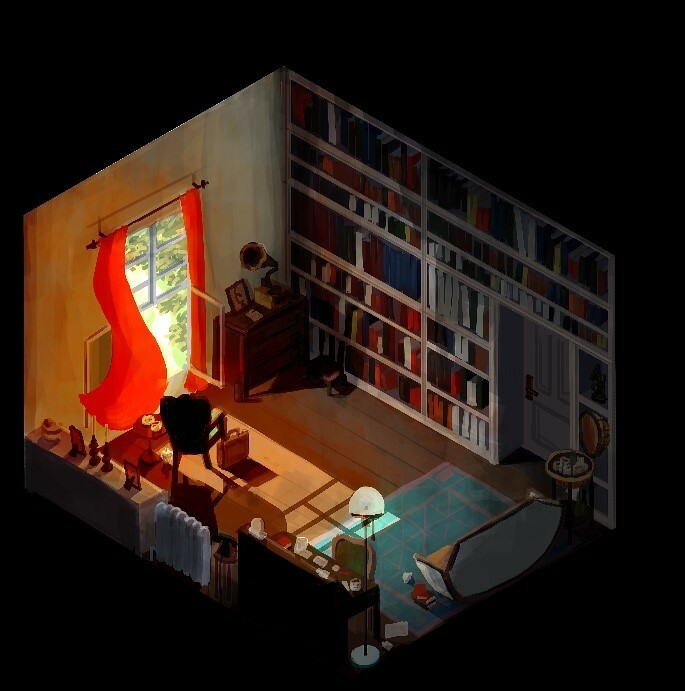 Players are permitted to rotate the camera - to view the scene from different angles and uncover hidden objects/evidence - and zoom - to focus more clearly on an item of interest. The layout of the environment is significant and keeping an eye out for visual clues may help you to start figuring out what happened. The output is similar to object inspection except not everyone will be so trustworthy so you'll need to use your deduction abilities to seek out the truth. In some cases, you'll need to discover new story threads before a suspect will give you useful information. In other cases, you may be able to call a suspects bluff by confronting them with evidence which disproves one of their lies. Story Construction is the second half of the interactive gameplay. Each time you collect evidence it is added to your detective workspace where you build your case. The workspace is comprised of a collection of nodes (aka evidence) and links (aka deductions). 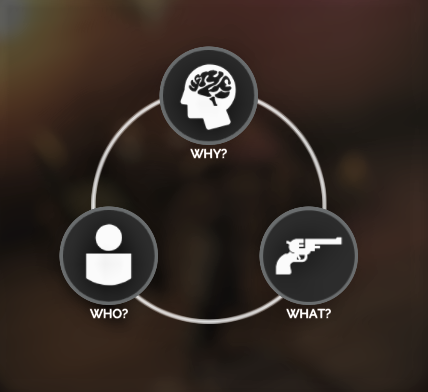 The aim is to connect evidence you think is related to tell us your story about what happened and in doing so you will unlock the ability to make a final accusation of (1) Whodunnit (2) With What and (3) Why. We expect players to be making certain key deductions as part of their story - something we check for when it comes to grading them - but we also like to encourage players to tell their own story. To support the former, we automatically generate a pool of links based on the story solution. To support the latter, we permit the player to create links to/from as many nodes as they like and arrange the workspace as they see fit. Every crime scene ends with an accusation. 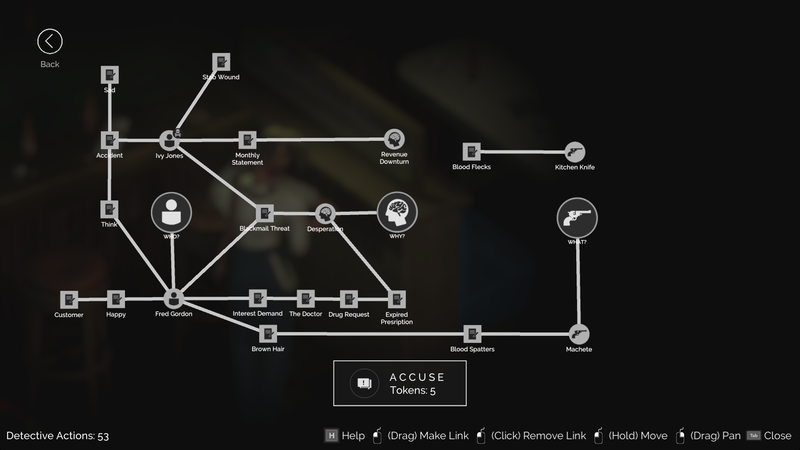 Once the player has made a link to each accusation node - who, what and why - we unlock the ACCUSE button and ask them to confirm their decision. Players have a limited number of guesses and are graded on the accuracy of their story so we aim to create a sense of anticipation as they work towards their final accusation. Look out for future gameplay videos where we'll reveal new locations and stories and show how much deeper the crime scenes can go. Thank you for checking out our initial gameplay post. We've been playtesting the gameplay regularly and are using the results of feedback to ensure that (1) the game is easy to understand (2) the game challenges your deduction skills and (3) the game makes you feel like a detective. This sounds interesting but it seems like the core aspect of the gameplay, or perhaps I should call it the core gimmick - the Story Construction - is something that players will just do in their head anyway. So if the only thing you have to do to solve a case is present your answers to the same three questions, then there's no need for this entire mechanic other than looking neat, but if the mechanic is integral to the very ability to present the answers, as this suggests: "The aim is to connect evidence you think is related to tell us your story about what happened and in doing so you will unlock the ability to make a final accusation", then the Story Construction will be annoying to everyone who can mentally connect clues in creative ways other than how the developers envisioned it (even worse considering it's procedurally generated). The mission complete screen has counters for Key Discoveries: evidence, queries, and links, so what would normally be an organic thought process of figuring things out appears to have been completely externalized, which might lead to the game being more of a mechanical than cognitive exercise at best, and a mere guessing game at worst. Now the stars, they are all angled wrong, and the sun and the moon refuse to burn. This sounds interesting but it seems like the core aspect of the gameplay, or perhaps I should call it the core gimmick - the Story Construction - is something that players will just do in their head anyway. Did you play Crimes & Punishments? Was there no pleasure in revealing new clue elements and then combining them to "spawn" new conclusions? Personally I thought it was a blast. Personally I don't see how it would be possible to have a "clues and conclusions" type of game that all takes place "internally", unless the game just said, here's the crime scene, now figure it out and click on someone to accuse them. That doesn't seem very fun. Personally I don't see how it would be possible to have a "clues and conclusions" type of game that all takes place "internally"
That's how the item/inventory aspect of the traditional point&click games functions, you're supposed to figure out which items are used for what and how, and how to combine them to get other items, and you get hints on how to do it from various sources: from talking to NPCs, looking at the visual part of the game, listening to the sounds, and so on. Now imagine a part of this being externalized, for example searching the scenery (the infamous pixel hunting) - through the ages it turned from something the player is supposed to do, and the game designers are supposed to pay attention to (so that the backgrounds have enough visual hints that something is supposed to be there), to something that the game engine just does by itself when you press the "reveal interactive points" key. What if every single aspect of a traditional point&click game was externalized and all its inner workings were exposed like that, is it still fun? Sure, Crimes & Punishments had this element, but it also had a lot of object manipulation and other traditional adventure game elements. Maybe this is just something that should be a part of a real game, not a game in and of itself. I only played The Devil's Daughter are the other Frogwares Holmes games good? I thought it was decent.. nothing amazing but was a nice game to play w/ my morning coffee.